I’m a member of the Lent Support Group that Alicia refers to in a previous blog. Our group decided to have a mid-Lenten get-together, which was very timely. It was the eve of Laetare Sunday, a day when we rejoice because the hardest part of Lent is supposed to be over and we are nearing the Resurrection. So we all decided to have a little sushi-making experience at Alicia’s place. And this may sound far off, but I thought of Little House on the Prairie when we decided to do this. I remember seeing episodes of this old TV series a long time ago, thinking, “Wow, I am so envious of their sense of togetherness, their enjoyment of each other’s company. There was no TV, iPod, Internet to distract them from truly communicating with each other, of enjoying each other’s presence.” I remember loving the fact that their life was so simple, and part of me always wished I could live something of that life. Well, I had a bit of that experience during our sushi night. Each one of us shopped for the sushi ingredients, ending up in places we would never have gone to if we weren’t so concentrated on having the ultimate and most authentic sushi-making experience we could come up with. 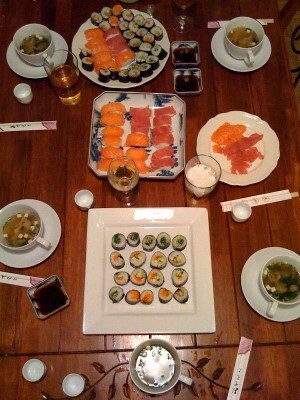 We spent at least an hour making sushi with our own hands. This was followed by three hours of just talking and sharing. (It really helped that the TV was practically non-functional, so no temptations in that area!) We shared our “confessions” of slip-ups with our Lenten resolutions. We talked about cultural traditions – well, with three Italians in the group, it mostly centered on Italian traditions! There was a lot of laughter, jokes, personal stories among five very different people connected by a faith that brought us together at Salt + Light Television. This is one part of why I love Lent. When you simplify life, life actually happens to you.